Villafranco’s is a favorite of ours and has the best johnny cakes in Punta Gorda. Next door to the Snack Shack, Villafranco's is always busy. Villafranco’s also serves a delicious lunch, and the owners are very nice. The St. Benedict Butterflies celebrated the end of the First Session and the Holidays with a Christmas Party. We decorated sugar cookies, played musical chairs, limbo, and a version of hot potato known as “Pass the Present.” The girls had a great time decorating the sugar cookies, one of my favorite holiday activities. Most of the cookies were heavy on the icing, but they still tasted good. The Dean Martin Café is located on Main Street near St. Joseph’s. It is one of the many food stands around PG. Have some fry jacks and beans for breakfast or grab some stew chicken and rice and beans for lunch. Gomier makes some of the best food in Toledo, and his restaurant is a vegetarian’s dream. Originally from the Eastern Caribbean, Gomier has a true gift when it comes to working in the kitchen. His baked goods are healthy and delicious, and the vegetarian lasagna and BBQ tofu are very popular. Anyone who visits PG must make a stop at one of our favorite places to eat, right at the entrance of town. Marian’s Bayview Restaurant is our favorite place to eat in Punta Gorda. Down on Front Street, past the Fisherman’s Co-Op, Miss Marian makes some of the best food in Belize. Miss Marian and her family are our good friends, and it has been wonderful spending time with them. If you come to visit, Marian’s will be first on our list of places to eat in PG. The St. Benedict Butterflies love chocolate, and we recently invited Juli, from Cotton Tree Chocolate, to do a chocolate making demonstration. Cotton Tree Chocolate is a product of Belize, and made from cacao grown right here in Toledo. Juli discussed how Cotton Tree Chocolate is made, the ingredients & how they are produced, and the chocolate making process. She even brought a chocolate tempering machine and talked with the girls about the importance of temperature when making chocolate. After the chocolate had reached the correct temperature, the girls had the opportunity to use a syringe to create chocolate disks. The girls were so excited and couldn’t wait for the chocolate to harden in the refrigerator. When the chocolate finally hardened, we enjoyed our sweet snack. No one could resist the delicious chocolate, as they licked their fingers clean. By the end of the end of the day many of the girls were covered in chocolate. This by far was one of the favorite activities of the summer. Both Juli and the girls had a great time. Thanks Juli for your hard work, patience, and delicious chocolate. Palma’s Tortilla Factory, down on Main Street, sells warm corn tortillas and fresh masa. You can also get delicious panades, tacos, tamales, tortilla chips, and cold drinks. We are always welcomed with a friendly smile from the Palma Family. It is avocado season in Belize. Avocados, or pears, as they are called in Belize, are all over the market and falling from the trees. Our neighbor has a pear tree and often brings some over to share. Great on a sandwich, used to make guacamole, or in a salad, simply delicious! Panades are a delcious snack and one of our favorites. You can get them filled with fish, chicken, beef, potato, or beans. Buy them on the bus, from a bucket or a bike, or get them from the lady down the street. 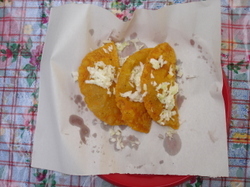 Panades are usually served on paper, with a side of sauce. And three for a $1 is simply a deal you just can't refuse. We headed to Placencia last weekend with a group of Peace Corps Volunteers for Lobster Fest, a weekend long festival celebrating the opening of Lobster Season. The weekend included lots of fun, music, dancing, karaoke, and of course lobster. Lobster tail, lobster bake, lobster creole, lobster strudel, lobster fajitas, lobster pizza, lobster kabob, everything lobster. We had a great time and can’t wait for Lobster Fest ’09.